One of the persistent debates in the world of electronic, ambient, and experimental music is what the proper role of theory and training should be, given the limitless frontiers of the canvas and the inherent lack of rules in the genre. Is an experimental artist who has never received formal training in music at a disadvantage or an advantage to one who has? Some claim that theory has the effect of installing mental blinders, causing the artist to adopt a viewpoint that inherently limits the breadth of choices they have available to them. Others point out that there is no substitute for formal training as a foundation for creating new music, and those who lack such training, no matter how considerable their natural talents may be, would go farther and accomplish more as artists if they would also seek a background in theory. Both arguments, of course, have elements of truth to them, which is why the debate probably will never be decisively settled. Unifying these two divergent points of view can seem to be an unreachable goal. Until now. Along comes a new artist to Earth Mantra by the name of David Herpich, who releases some of the most powerful and sublime experimental electronic ambient music we have yet heard, under his Emerald Adrift project name. And unification is reached, at last. This artist certainly has a sterling academic background in music, with multiple degrees in theory and composition at both undergraduate and graduate levels. And yet his music is anything but conventional, shattering genre limits and traditional boundaries as if they are not even there. Indeed, Emerald Adrift blends so many diverse influences and incorporates such a breadth of musical styles and forms that it is difficult to characterize exactly what kind of music it is. Is it influenced by classical music? Definitely. Is it tonal? Without doubt. Does it include atonality? Certainly. Does it have elements of ambient and new age? Again, yes. Is it compositionally strong? Goodness, yes. Is it academically informed? Yes, again. Yet despite the strength of the theory that went into the composition and performance, nowhere does the music limit itself. Nowhere do boundaries prevent the finished pieces from achieving their full glory. It is as if a musician with years of advanced training simply set aside all prior conceits of what music should be and simply let the music pour out of his heart. Not only does David Herpich bear no chains from his formal background, but he revels in his knowledge, taking everything he has learned, then throwing away the rule book and creating the music that he feels and hears inside. And the result is stunning. Folks, this is how it should be. There is no reason a formally trained muscian with a comprehensive knowledge of theory cannot push boundaries and seek new frontiers every bit as effectively as one who lacks similar training. In fact, the synergy of the two produces music that is stronger than the sum of its parts. Emerald Adrift is proof positive that not only is unification possible, it is grand. It is the goal to which we all should aspire. 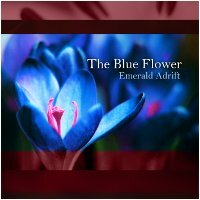 Earth Mantra is proud to welcome Emerald Adrift to its roster of artists and to bring the amazing debut release The Blue Flower to you. Listen to it repeatedly and you will begin to hear what we are talking about. Highly, highly recommended. This one's looking like a winner! Going to give it some extended listening and should include it in my review chart at the end of the month.